SAFETY WARNING: Never start and run your engine inside of a closed garage. Always make sure there is good ventilation to prevent carbon monoxide poisoning. Carbon monoxide fumes are produced by your engine’s exhaust gases. 2. Turn on your ignition by turning your key to the 2nd turn. The engine will be off, but this provides power to your dash lights, radio and also the OBDII diagnostic port. 3. 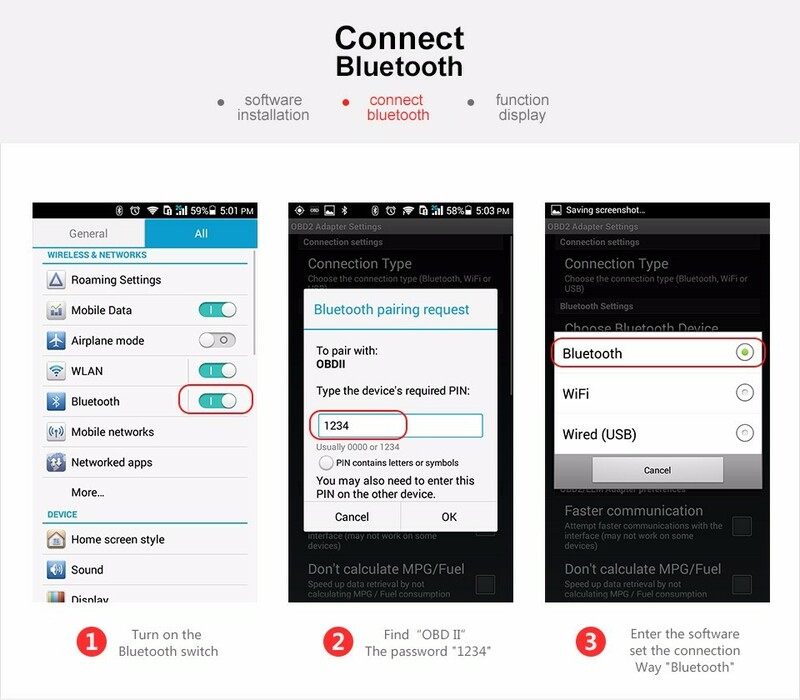 From your Android Smartphone or tablet, go to your SETTINGS, thenWIRELESS & NETWORKS, then BLUETOOTH SETTINGS. Turn on Bluetooth, scan for the nearby devices and pair your phone with the scanner. 4. Open your preferred app. I will use the Torque app as an example. Go to the Settings page by pressing the Menu button on your device. 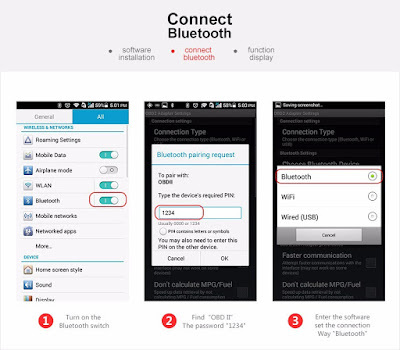 Then go to “OBD2 Adapter Settings”, then “Choose Bluetooth Device”, and then select the paired Scanner. This step is critical because the App won't know to detect the ELM327 Scanner and it won't connect to the ECU! 5. Go back to the App’s main menu and it will begin establishing a connection with the scanner. All 4 icons will be solid blue when it’s connected (Torque).